During a rare bout of insomnia this morning (Is it insomnia, if it’s rare? ), I tried a version of counting sheep that only made things worse, but let me start yesterday afternoon. Getting excited about the prospect of leaving New York City for someplace further up the Hudson Valley, I’ve been reading a first-person account of an early Dutch settler’s description of the land and the people who lived here. Adriaen van der Donck published A Description of New Netherland in 1653 to keep the Dutch public interested in the colony around New Amsterdam. Russell Shorto’s The Island at the Center of the World claims van der Donck as a sort of American proto-patriot, a democratic agitator whose vision for New Amsterdam found expression in the Revolution that only came years after the Dutch had given the colony up. A disciple of Hugo Grotius who was fluent in Mohawk and other native languages, he was, among other things, the first North American civil rights lawyer, a guy the Indians knew they could at least ask to represent them if a Dutch or English settler broke the terms of an agreement. From “A Description of New Netherland,” translated by Charles Gehring. 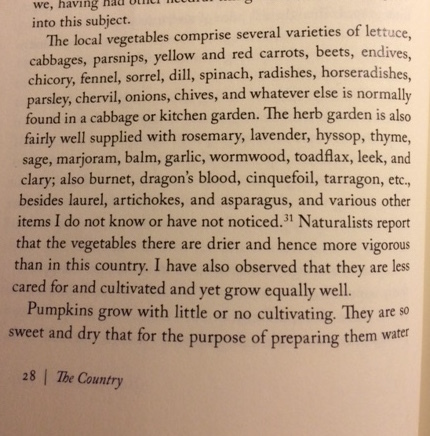 A few years ago, when my head was completely in the city, I might have skimmed the chapters on nature and agriculture, but now I can’t get enough detail about how to grow squash. Knowing that van der Donck was making a case for our region, you can’t help but marvel at the compliments he comes up with. In his description of “the South River,” i.e. the Delaware, he says, “Well-traveled observers rank this river with the most attractive anywhere and compare it to the superb Amazon River, not so much for its size as for the other outstanding qualities…” We can cut him a break for having never seen even a photo of the Amazon, but if that’s how far he’d go to make a case, then how funny that he’d devote paragraphs to how easy it is to grow pumpkins and melons here. With his lists of vegetables on my mind, I went to sleep but woke up just four hours later. My oversampling of distilled agave with lime earlier in the night might have had something to do with it, but I was wide awake! Ever since I read a few years ago that we once divided the night between “first sleep” and “second sleep,” and waking up for a while in the middle of the night was considered perfectly healthy, and since I rarely have to set an alarm for anything early morning, I’ve tried not over-reacting to sleeplessness and instead gotten up and read for a while. This morning, however, I knew my wife would be getting up early and wanted to let her sleep, so I vowed to do all I could to join her. My usual method for this, my “counting sheep,” was to name the U.S. presidents backwards in time. I can do this, give or take a few pre-Civil War slave masters, all the way to Washington. I get riled up thinking about Rutherford B. Hayes, so my method changed to listing first ladies. These I get cloudy on after Lou Hoover (who was, incidentally, fluent in Chinese), which doesn’t always give me enough time to get bored and fall asleep. It was too exciting! I had too many moving parts to keep an eye on. I was thinking about prime numbers, and why they tend to come in clusters. 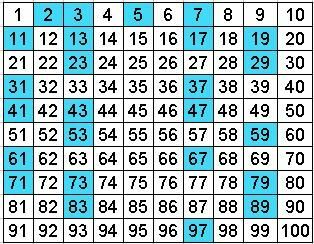 That secret’s in the multiples of three: Three land three times between one and nine, responsible for two of them (3 and 9) being composite, and not prime, numbers. Then they go into a sort of hiding for a decade, doubling up with other multiples on 12, 15, and 18. It’s these areas, every third decade – the teens, the forties, and seventies – that tend to have lots of prime number. The Three is like the Bishop in chess: It can go many places, but some it can’t. Already I was thinking, “He gets lazy.” I’d given this number a personality, but I wanted to see just how lazy, and the answer was “Pretty damn lazy.” The forties would have a prime number infestation if not for Seven times seven! (The Seven is like the Knight in chess, who swoops in from an unexpected direction.) I had so much to look forward to, I exhausted the alphabet, crops corresponding to prime numbers and all, and had to start again at 27 as letter A, with new vegetables for any letter that already had one, so it was “…twenty six, twenty seven, twenty eight, Cabbage, thirty, English peas, thirty two,” etc., all the way to 43, which was Q, and I’d already used Quince. Now I was wracking my brain to think of another crop that starts with Q. All I could figure was Queen Anne’s Lace, which grows like a weed in cow pastures. I had to change the rules, to make the numbers come and go quicker. It was simply too exciting. I am still, in fact, awake, four hours later. Whatever your counting sheep is, you are walking a thin line between coming up with something that is monotonous and rhythmic enough to lull you, and just scintillating enough to keep your attention. Good morning!